As a child I had read much about the Chalukyas in my history books. Naturally when I had an opportunity to see this for myself, I jumped at the opportunity. Setting off to Hangal in Haveri district near North Karnataka is a wonderful way to see the famed Hoysala architecture. It is said that Hangal was the capital of a branch of the Kadamba dynasty. From 1068 to 1203 A.D. the Hangal Kadamba family ruled from here as the feudators of the Kalyana Chalukyas. While Belur and Halebid are the front runners as far as stone Hoysala architecture is concerned there are several other temples that are a fine example of this era. So I headed towards Hangal in Haveri district and driving through a beautiful countryside, reached my first stop that was at the 12th century Tarakeshwara Temple. A beautiful large wooden chariot outside the temple welcomes you to this place. Step into the ramparts of this ancient temple and you see immediately that this is like no other. You will see a small Ganesha temple with a Nagara style spire at the entrance of Tarakeshwara temple. The plan of this temple reflects a good example of the ‘Kalyana Chalukya Architectural Style’ and has a garbhagriha, antarala, navaranga, sabhamandapa and a mukhamandapa. Originally the navaranga had pravesamandapas on north, south and eastern sides. Presently, the north and south pravesamandapas have been converted to garbhagrihas. 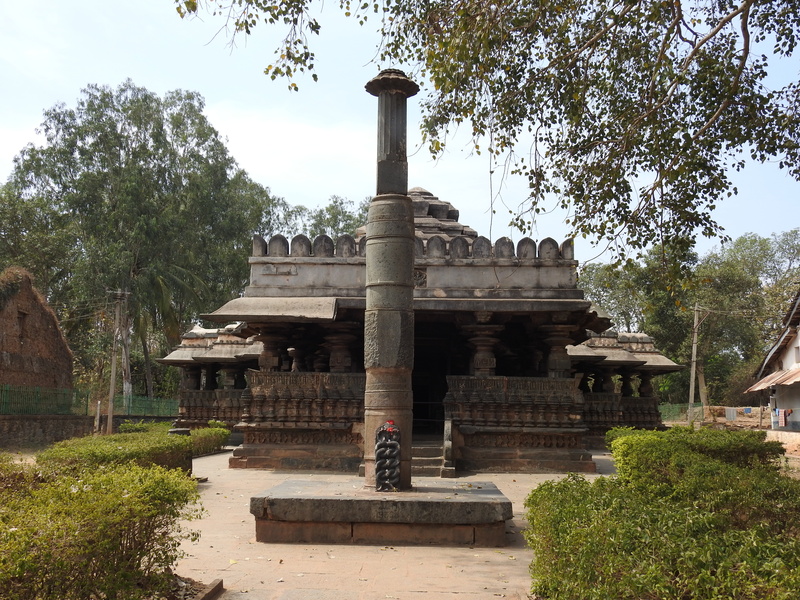 The main sanctum sanctorum has a Shiva Linga called Tarakeshwara (after which this temple is named) along with sculptures of Vishnu, Brahma, Kartikeya and Nandi. The exterior wall of the temple has Bas relief sculptures of the Ramayana. The incompletely carved images of the Dvarapalakas are very attractive. Special mention must be made of the Kadamba Nagara Shikara above the Garbagriha that has intricately carved motifs including a sculpture of a hero fighting a lion that resembles the Hoysala emblem. Look at the walls and the ceiling and you can see murals and etchings that are in a bad shape now and have almost disappeared. However what is remaining truly reflects the artist’s expertise. Likewise the ceilings of the temple are done up in an ornate manner and you must not miss looking up to see the lovely floral patterns here. Every pillar is different and again has intricate carvings with floral and animal motifs as well as several deities. The decorated pillars a typical Chalukyan feature also has Dravidian and Nagara influences that add a distinct character to this temple. The large eight-pillared hall with a lotus rock ceiling and the main central hall with a concentric domed ceiling with a rosette pendant are key distinguishing aspects of this temple. You will need to spend some time here as each sculpture and etching is nothing short of an architectural marvel and a celebration of stone architecture. Continuing my exploration of the old temples in Hangal, I reach the Billeshwara temple that is located opposite to a lake on the Hangal-Bankapur Highway. The town has a huge lake called Anekere which is located near Billeshwara temple. In fact this temple is not inside the main town and you will need to reach the outskirts and you will find it on the left side as you drive on the Hangal-Haveri road. The temple is situated on a slight elevation off the ground and is a solitary structure that seems incomplete. You will not find any shikhara or sabha mantapa here and it seems as if it was abandoned for some reason. This is a smaller structure and has only a garbhagriha which houses a large Shiva linga that seems to be of an early origin. The ceiling of the garbhagriha is decorated with lotus medallions. The highly ornate door frame of the garbhagriha is divided into five sakhas. A seven-stage doorway with each stages having a theme of its own adorns the garbhagriha. Said to date back to the 11-12th century, the exterior of the temple is decorated with exquisitely carved miniature shikaras over pilasters. There is a beautiful moon stone in front of the temple. I was quite fascinated to see the carvings of the serpents with human heads, lions, animals and birds intertwined with foliage here. The temple has fine specimens of the architecture of the period and must be on your next visit to Hangal. Both the temples are a great way to visit the past and offer a sneak peek into a lost world one which was culturally rich and has historical reference even to this day. Hangal is about 350 km from Bangalore and has good road connectivity through the national highways. These temple are situated in Hangal, in the Haveri district of Karnataka about 75 kilometers from Hubli – Dharwad, on the banks of the Dharma River. The best time to visit this temple is during the festive time of Shivaratri. Accommodation options are limited in Hangal and it is recommended to stay in Hubli. 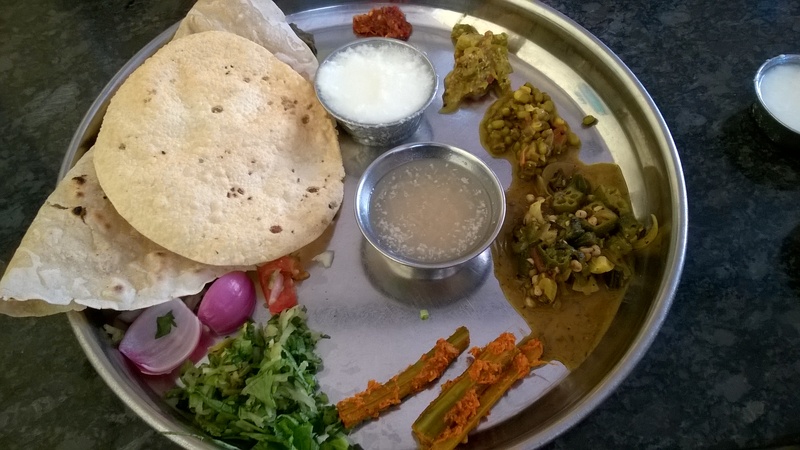 While you are here try an authentic North Karnataka meal of Jollada Roti at one of the traditional khanavalis. Read the story in Deccan Herald’s Spectrum here.